Apple’s streaming protocol can send audio to a variety of devices. Here’s how to make it work for you. If you use a Mac or an iOS device, you may know about AirPlay, Apple’s streaming protocol that can send audio and/or video to a variety of devices. Initially launched in 2004 as AirTunes, for audio only from iTunes to Apple devices, AirPlay is now supported by speakers, amplifiers, receivers, and more, from dozens of brands. 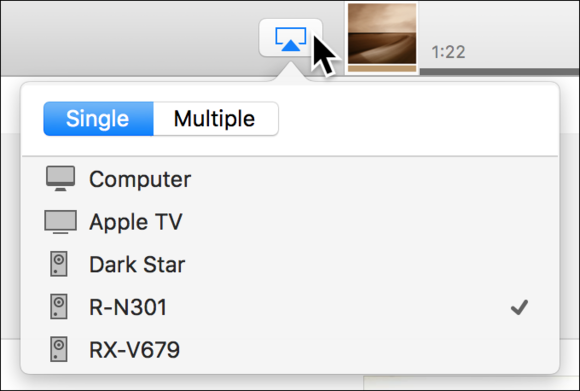 While you don’t have many options with AirPlay Mirroring (streaming both audio and video; you can do this from a Mac or iOS device to an Apple TV), using AirPlay with music is incredibly flexible. There are ways to use AirPlay you may never have thought of. Here’s an overview of some of the ways you can send music throughout your house using AirPlay. When you’re playing music from iTunes, you can choose an AirPlay target by clicking the AirPlay button to the left of the iTunes LCD. Choose a single device, or, if you want to send music to multiple locations, click Multiple and check the devices you want to use. Choose an AirPlay device (or several) from this menu in iTunes. On an iOS device, tap the AirPlay button in Control Center, or in a music app, and choose a speaker; you can’t stream to multiple targets from an iOS device, however. AirPlay targets include the Apple TV, standalone speakers, and hi-fi amplifiers and receivers. You can stream to any system using a $99 AirPort Express; just connect its combination analog/optical audio jack to a device with the appropriate cable. The AirPort Express also lets you extend a Wi-Fi network; but if you simply want a device to use AirPlay, get the 3rd generation Apple TV, which offers the same streaming options, as well as all the other features of that device. Make sure to check Enable AirPlay/AirTunes on the Music tab of AirPort Utility when setting up the AirPort Express, if you’re using that device. More and more home audio hardware supports AirPlay. Not just standalone speakers, but full-size amplifiers and receivers. So you can stream from your iTunes library or iOS device to a stereo system. Brands such as Yamaha, Philips, Marantz, Denon, and Sony offer devices that support AirPlay. Some merely play audio, but others also display information about what’s playing on their display. Some amps and receivers display information about the currently-playing track. If you want to make your home entertainment system AirPlay compatible, check out which devices support the protocol. 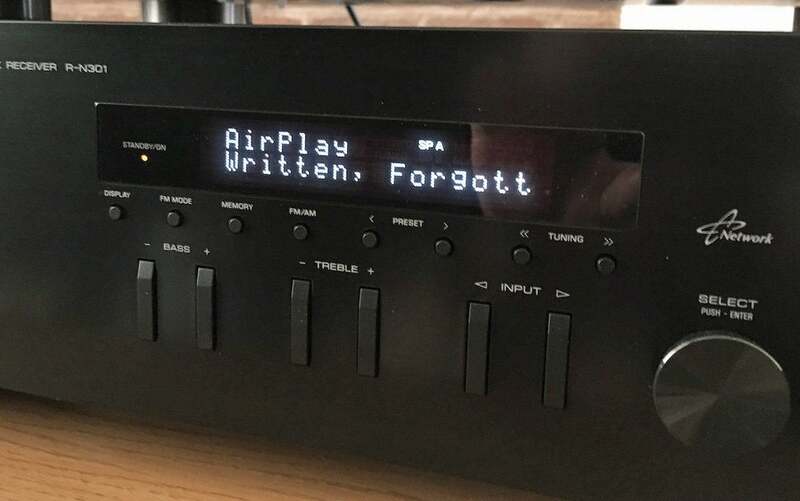 Even if you don’t plan to use AirPlay right now, if you’re in the market for new stereo equipment, you might want to get hardware that supports this protocol in case you change your mind. You may have discovered that third-party AirPlay devices aren’t always ideal. Some devices lose connectivity, or play back music with stutters and pauses. My experience with such devices has been mixed, and I think the problem is that these devices don’t have adequate antennas to pick up Wi-Fi signals efficiently. In addition, some hi-fi separates may offer AirPlay but not have integrated Wi-Fi. With some amplifiers or receivers, you can buy an optional Wi-Fi adapter to use them wirelessly. You can get around this using AirPlay over ethernet. If you have an amplifier or receiver that supports AirPlay and has an ethernet port, connect it to the network; AirPlay works perfectly. I use the Yamaha R-N301 ($300 on Amazon) connected to my network with a powerline adaptor. (You don’t need very high bandwidth for audio only.) Streaming is always perfect; no glitches, no dropouts. While Macs can be AirPlay sources, they can also serve as AirPlay targets, with the help of third-party software. I use Rogue Ameoba’s Airfoil Satellite (a free addition to the $29 Airfoil app). When this is running, my Mac is an AirPlay target, and I can stream music to it from any other Mac, or from an iOS device. The Airfoil Satellite window shows what’s playing (with album artwork) and gives you controls to play, pause, skip tracks, and change volume. 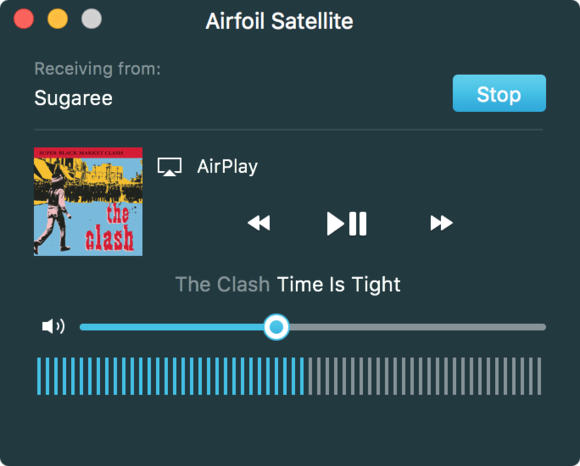 Stream to a Mac with Airfoil Satellite. Why would you want this? You may want to listen to audio from an iOS app on your Mac, rather than through your iPhone’s little speaker, or you may even want to stream from one Mac to another. While AirPlay is an Apple protocol, it’s wide adoption in the home audio industry has led at least one Android phone manufacturer to support the protocol. The forthcoming HTC 10 will support AirPlay streaming, so even if you don’t have an iPhone or iPad, you may be able to use AirPlay. Streaming to every room is easier now that AirPlay is widely supported. 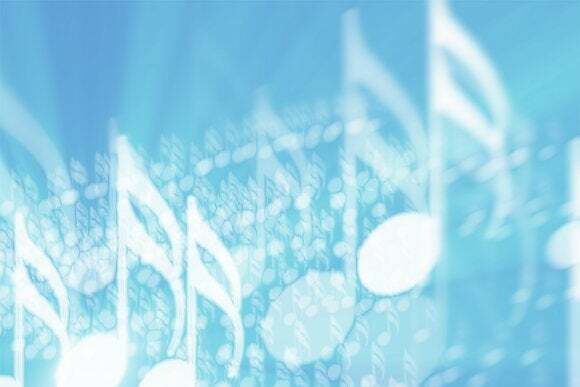 With the above tips, you’ll be able to get music to any location in your home.